If only it was that simple. Katharine is unable to tolerate the weakest poison, and Arsinoe, no matter how hard she tries, can’t make even a weed grow. The two queens have been shamefully faking their powers, taking care to keep each other, the island, and their powerful sister Mirabella none the wiser. But with alliances being formed, betrayals taking shape, and ruthless revenge haunting the queens’ every move, one thing is certain: sthe last queen standing might not be the strongest…but she may be the darkest. I knew that this book could have been a huge disappointment because my expectations were through the roof. I mean, it's Kendare Blake! I LOVE this woman's writing and storytelling! Even with the threat of disappointment, I had to take that chance. Man, oh man am I glad that I did. This is the story of three queens, triplets, born with different sets of abilities.They are ripped away from each other at a young age and taught to hate each other. They are taught that one day, they will have to kill each other so that one may rise and become the queen. But this year it seems that only one of the queens has power, and it is the strongest of many generations. This year, she will be the queen... And there are many who will fight, no matter what it takes, to make sure that she is crowned. Mirabella is a natural and has been since a young age. Her powers are renowned throughout Fennbirn. It is said she is as fierce and cruel as her elemental magic, and stunningly beautiful. Katherine is the Poisoner queen but it seems the Goddess forgot to give her the power. She is weak and bone thin, breakable. But there is an underlying fierceness to this one, and a dark side that won't stop trying to best her sisters. Arsinoe should be the Naturalist queen, but it is her best friend that has the powers of a queen instead. She doesn't really mind though. Arsinoe doesn't care about rules, or winning, she cares about her friends. But what seems isn't always what is, and by the end of the story you are left questioning everything. 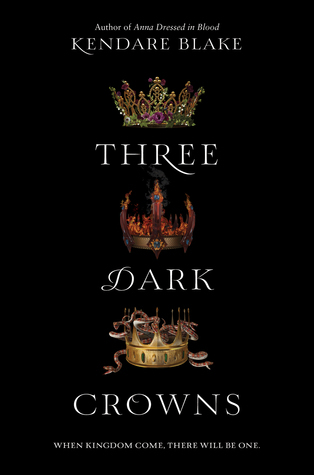 Three Dark Crowns is a fierce, dark story. The battle of the sisters is horrifying, yet so fascinating. They are three sisters who once loved each other fiercely, but only one can win. Only one can live. This brought such a sense of urgency to the story and had me on the edge of my seat. The queens are all fascinating in their own very different ways, but the cast of characters surrounding them are just as intriguing. Kendare Blake didn't just throw in secondary characters as filler; she filled them with life and made them important. Another thing that I appreciated is how hard it is to root for just one of them or how hard it is to hate the ones who seem like villains. Because if you think about it, they aren't villains... they are doing what they have always believed to be the right thing. This is their way of life. The entire concept of the story, the marvelous world-building, and the fantastic cast of characters in Three Dark Crowns blew me away. I couldn't stand to put this down for even a second. If you are a fan of dark stories that pull on your emotions in a constant tug-of-war, read this book. It is such a great story and I am so happy that I was able to read and review it!